The limb of the large brass disc bears the division of the year into months, days and quarters of days, with the addition of one day for leap-years. One sector of this graduated arc displays a second external division into twenty-four parts, which are, in turn, subdivided into twelfths. The sector bears the inscription: 'The howerly motion of the (moon symbol) middle place from the Sunner by 360 for the merid. Of London, according to the tables of Renaldus which differeth 8'37" from Maginus'. This inscription suggests that Dudley, the maker of the instrument, used the tables of Rheinhold and Magini. These inscriptions are followed by a zodiacal graduation marked 'The Ecliptick' and 'The [Sun] middle place'. Next comes an area with indications of years and 'epocha in 1601', 'The yearly motion of the first stars of Aries beginning 1600'. This inscription corresponds to a small nonius of 5 divisions with the years 1600-1700. A division into 29 days and approximately 12 hours follows. This is subdivided into 24 hours to correspond to the synodic lunar rotation. A zodiacal division of groups of 30? divided in quarters follows. This graduation is displaced with respect to the first by 2? 1/8. A further graduation is divided into 27 days 7 1/3 hours (anomalous revolution) and each day is divided into 24 hours. A partially graduated region follows, bearing the sign of the sun in correspondence with the letter N of the preceding scale. Next, there is a band with the last days of the month displaced with respect to the preceding days and partially superimposed, and an eccentric circle divided into 360? and half-degrees in both directions. This eccentric has its centre in a point in which the inscription 'The cen. of ye ecliptick' can be seen. A smaller circle, also eccentric, follows the eccentric circle, with the same centre and oblique (Tychonic) divisions up to 1? 57? on the four quadrants. In the centre of the instrument, one reads 'Sir Robert Dudeley was the inventor of this Instrument'. The face is completed by a graduated ruler which is fixed to the centre of the instrument, and provided with a circle which is joined to it and divided from 0 to 180 and 180 to 360. The back of the instrument is divided into 231/2 (ecliptic), beginning with the limb, with divisions which grow regularly, and then into 90? and into 27 days of 51/2 hours, with the inscription: 'The dayly motion of the (moon symbol) middle latitude'. These are followed by other divisions relating to the motion of the moon. The instrument is cited in the Medici inventories beginning with that of 1638. In the additions for 1654 it is cited as a part of the bequest made by Sir Robert Dudley to the Grand Duke of Tuscany on his death in 1649. See R. Dudley, Arcano del mare (Florence, 1646); Catalogo degli strumenti del Museo di storia della scienza (Florence, 1954), pp. 69-71; M. Miniati, Museo di Storia della scienza: Catalago (Florence, 1991), p. 32. Very large brass disc, comprising an outer ring with a throne, shackle and suspension ring, and within this a rotatable disc; ring and disc have engraving on both sides. On the recto side two index arms extend from the disc across the ring and four other index points move with the disc. On the recto side, the edge of the ring has a scale 1 to 24 hours, covering 243.5 degrees, divided to 1 hour, subdivided to 30 and to 5 minutes, numbered by 1 hour, marked: 'The howerly motion of the R middle place'. Then a calendar scale with a figure in degrees, minutes and seconds for every day giving the ecliptic longitude of the moon. The next scale has a figure in degrees, minutes and seconds for every year from 1601 to 1631, the first being marked 'In 0 1601 Epocha'. 'The yearly motion of the middle place from the Sunnes by 360 from the merid: of London according to the tables of Renaldus which differeth '8 ? '37 from Maginus'. Next is a zodiacal scale, marked 'The [Sun] middle place', divided to 10 degrees, subdivided to 5, 1, 1/2 and 1/4 degrees, numbered by 10, both in sections of 30 degrees, with zodiacal symbols and 0 to 360. Within this, the inside circle on the ring is marked with positions for every years from 1601 to 1632 for 'The yearly motion of the [Moon] Anomil? from The Apogeon of the [Moon] great Epicicle by 360 and Meridian of London'. At the very inside edge of the ring are short scales for 'The yearly motion of the first starr of Aries begininge 1600' and 'The yearly motion of the [Sun] Apogeon begininge 1600'. The whole of the ring is marked 'THE ECLIPTICK'. The outer scale on the disc is for the zodiac, numbered both within each sign and 0 to 360. Next are a series of lunar scales, for the daily, monthly and two-monthly motion of the centre of the moon, then for the daily, monthly and two-monthly motion of the lunar anomaly. Within this is an eccentric circle, divided 0 to 360 and 360 to 0, 'Apogeon of the [Moon] great Epicicle or Sunes Excentrick'. Within this a rectangular grid is twice marked 'The prosthaph?reses or ?quations of the [Moon]'. The inscription 'The distance of the [Moon] from the earth in semidiameter of the earth' also occurs twice. The grid terminates at a second circle, with a scale marked 'The prosthaph?reses of the Sunne'. Around the centre is the inscription 'Sir Robert Duddeley was the inuentor of this Instrument', while at the centre a hole with a screw and pivoted attachment for a line is marked 'The cen: of ye ecliptick', and a nearby point is marked 'The cen: of ye [Sun] excent'. 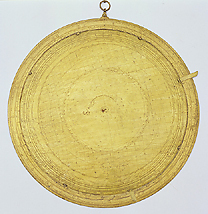 On the verso the outer scale on the ring is for solar declination, then scales for the latitude and motion of the moon, while the disc has a diagram for the times of tides. An index arm (presently detached) has a scale 0 to 90 (at the pivot), divided to 10, subdivided to 5, to 1 and to 1/2, numbered by 5, and at 20 1/2 degrees is a disc with a degree scale numbered 0 to 180 and, in a second rotation, 180 to 360, marked 'The [Moon] little Epicikcle in Quadratura' and 'In the midle Coniunction & opposition'. An associated protractor with a pivoted arm is an open semicircle with a degree scale 0 to 180, divided to 10, subdivided to 5, to 1 and to 1/2, numbered by 4. Within this scale is a semicircular slot for a clamping screw (now a modern replacement) for a pivoted arm, and within this the cardinal compass points are marked. The pivoted rule, extending beyond the semicircle, has a linear scale 0 to 60 five times, the 0 to 60 scales being numbered 1 to 5 and each divided to 30, subdivided to 10, to 2 and to 1, numbered by 10. A detachable rule with the same scale can be attached to either end of the diametric bar of the protractor.